23 Days Best China Small Group Tour with Yunnan and Tibet Mount Everest Discovery will take you to explore the most beautiful parts of China including the mysterious Yunnan and Tibet, the Panda Center Chengdu, Beijing, Xian and Shanghai. 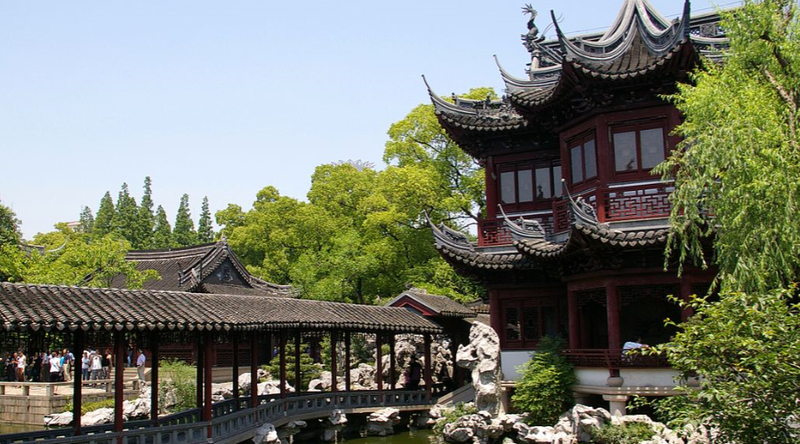 Explore the best parts of China with experienced English-speaking guides on our small group tours (with max. 18 travelers) departing from Beijing. We guarantee small group sizes to ensure that you have an excellent holiday experience. While travelling with us you will be with like-minded people and enjoy a relaxing vacation as well as plenty of free time within the itinerary. Have a wonderful tour in Tibet and Mount Everest. 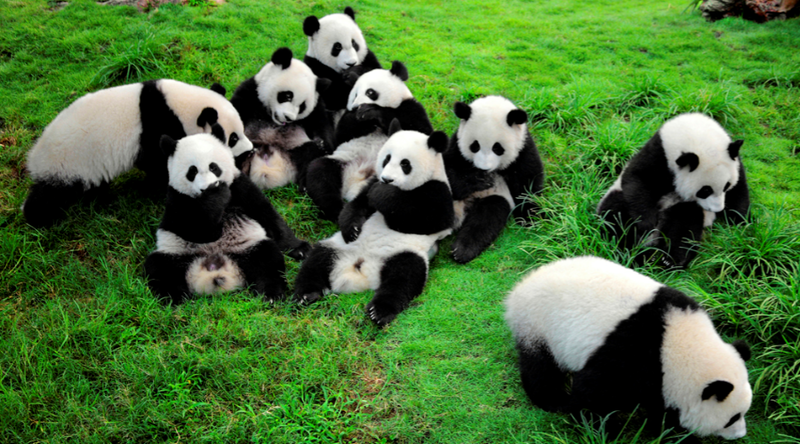 Observe the cute giant pandas at Chengdu Panda Base. Arrive in Beijing, the capital city of China, you will transfer to your hotel on your own. Free at leisure for the rest of the day. Pick up service by your tour guide and driver(7:00am-7:30am). Great Wall at Mutianyu-Driving Time (50 minutes). Great Wall at Mutianyu-Sightseeing (2.5 hours). (Optional: Great Wall Cable Car, not included in tour price). Lunch at the local restaurant (Lunch, 1 hour). Drive back to downtown and drop-off at your hotel around 16:00. Mutianyu Great Wall, featured “graceful”, enjoy the best quality among all Wall sections, 80km north-east of Beijing. It is is encased by sprightly streams and lush greenery. Mutianyu Great Wall is older than Badaling Great Wall, it has 22 watchtowers, about one every kilometer. Built mainly with granite, it was opened to tourists on May Day in 1986, the second Great Wall site opened to tourists after BaDaLing. MuTianYu Great Wall passes through beautiful forested hills with streams.There is a cable car at MuTianYu to whisk you up onto the Great Wall. Pick up service by your tour guide and driver at 7:30-8:00. 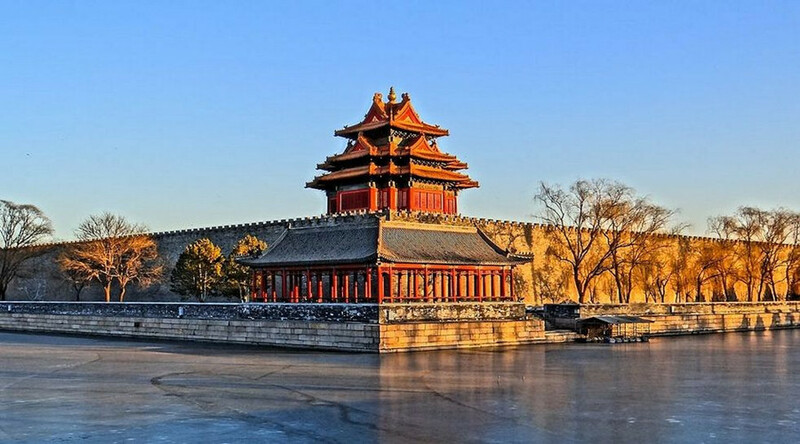 The Forbidden City is the best preserved imperial palace in China and the largest ancient palatial structure in the world. The splendid architecture of the Forbidden City represents the essence and culmination of traditional Chinese architectural accomplishment. 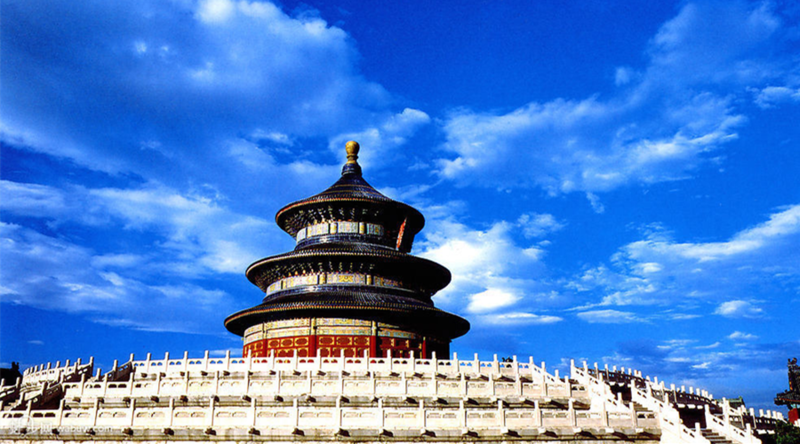 The Temple of Heaven is spectacular temple that the Emperors visited during the Ming and Qing dynasties to pray for a good harvest. Because of the Temples beauty, many locals still visit and use the site to exercise. The Summer Palace is another breathtaking area that will be seen. Entering into the gates of the Summer Palace is like stepping into another world. The grandeur and beauty of the Palace is overwhelming and is sure to impress anyone. 1 City central line: Wangfujing street- Wusi street- Jinshan Garden. 2 City north line: Wenjin street- Deshengmen Gate- Drum& Bell Tower- Shichahai – Second ring road- Dongbianmen Gate. 3 City south line: Chongwenmen Gate- Old Concession- Tian’amen Square- Qianmen street. Imperial outer view (Jingshan Garden – Imperial Palace – Beihai Park). Ancient city wall ruins at Dongbianmen. Where you will have the chance to enjoy the authentic, local neighborhoods also declared UNESCO world heritage site. Take the speed train from Beijing to Xian (NO.G663 15:45-21:25) ,meet your local guide and driver in Xian and transfer to the hotel. Be met by your guide and driver at your hotel in the morning——The Museum of Terracotta Warriors Sightseeing (including Pit 1.2.3 of Terracotta Warriors and The Bronze Chariots and Horses) (2 hours) ——Lunch at Local Restaurant(1 hour) ——Banpo Museum(1 hour)–The Big Wild Goose Pagoda, Cien Temple Sightseeing(1 hour )–Drop-off service at your hotel and end one day’s trip. You will take taxi to Xi’an Train Station to take the train to Chengdu. Train schedule will be T7 6：41-20：36-soft-berth. You will spend one full day on the train, manage the lunch on your own. Upon Chengdu arrival, you will take taxi to hotel in Chengdu downtown on your own. Check in hotel and take good rest. *10:00-11:00 Sightsee at Golden Submit, visit Huazang Temple, enjoy the magnificent view of the clouds, mountains, forest. *12:00-13:00 Take Sightseeing bus down to Wannian Temple, located in middle of the mountain. *13:00-17:00 Trekking along the path of essential scenic zone to visit Wannian Temple, Qingyin Pavilion, Moneky Zone, etc, walk down hill to WuxianGang. *18:00-20:00 Take Bullet Train back to Chengdu within only 1.5 hours, Tour ends at Chengdu Railway Station. Take the morning flight to Kunming, meet the local guide and driver, transfer to visit The Stone Forest. You will drive 1.5 hours to the Stone Forest. An old local saying says that ‘If you have visited Kunming without seeing the Stone Forest, you have wasted your time.’ Truly, the Stone Forest is one of the most important attractions of Yunnan. After lunch drive back Kunming to relax at the Green Lake and Nanping Street. You will be dropped to Kunming Railway Station after dinner, to catch up with your overnight train to Dali. Our Dali guide and driver will pick you up at Dali Railway Station, then you be transferred to take breakfast at Dali Old Town. After your breakfast, you will visit Dali Old Town, walk around the Foreigner Street and enjoy the relax time with local people. 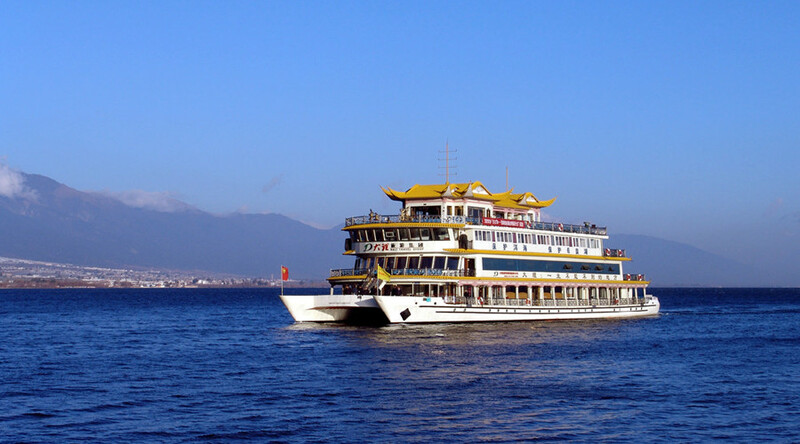 You will have time to climb up to the City Wall of Dali, then you will have panoramic view of the Erhai Lake. After Dali Old Town, you will drive to visit Three Pagodas in Chongshen Monastery which has a history of over 1,800 years located at the foot of Cangshan Mountain facing to the Erhai Lake. Three Pagodas are made of three ancient independent pagodas forming a symmetrical triangle. After last, you will head for Xizhou Town to fully appreciate Bai-style traditional architectural courtyards, taste their fragrant Three-Course Tea and explore their distinctive culture. Visit Zhoucheng Village and the Bai people’s Tie-dying cloth workshop where you can take some special souvenir with the Bai ethnic style. In the morning, drive from Dali to Shibaoshan mountain. The most prominent sight at ShibaoShan is the Stone Bell Temple with its 139, well preserved stone carvings. These magnificent stone carvings date as far back as 1300 years to the once powerful Nanzhao Kingdom during the Tang Dynasty (618-907). The carvings are testimony for a time when Mahayana Buddhism from Tibet started to spread in the Yunnan area. 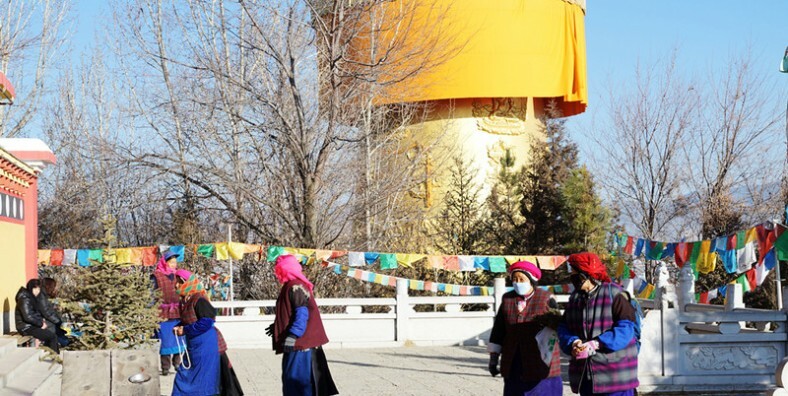 Another interesting sight is the ‘Suspending Temple’, also called the Baoxiang Temple. The Baoxiang temple was built on a ledge of a nearly vertical cliff and can only be reached by a long flight of stairs. On a clear day the views from the Baoxiang Temple over the Shaxi valley are simply magnificent. After lunch drive to Lijiang. Upon arrival, you will visit Lijiang Ancient Town-the history dates back to over 800 years ago. Besides its unique architecture and local ethnic culture, it is also known for its orderly arrangement of bridges and waterways. Walk along the winding cobbled paths — it is said that you won’t get lost as long as you follow the water. Appreciate the Naxi people’s brilliant skills in architecture and fine arts at Mufu Mansion, the ‘Forbidden City’ of Lijiang. You can also climb up to Lion Hill to have a bird’s-eye view of the whole town. 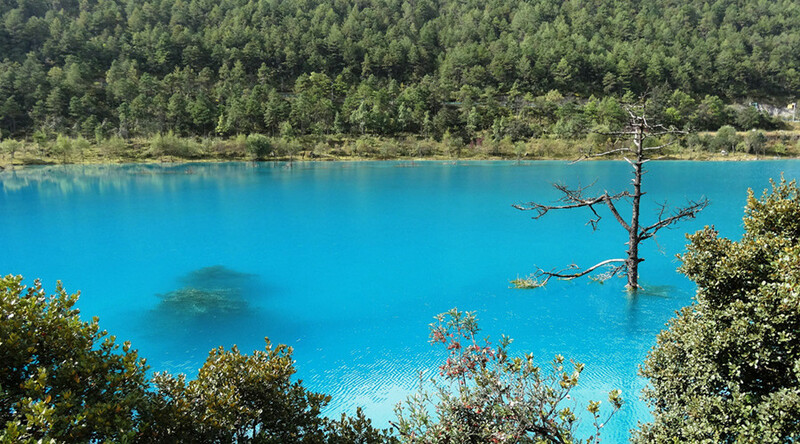 Then pay a visit to Black Dragon Pool Park, where the view of the Jade Dragon Snow Mountain is one the most famous postcard-perfect sceneries in southwest China. Pick-up at 7:30am, drive about 30KM to Jade Dragon Snow Mountain, where you will take the sightseeing bus for a short visiting through the Baishuihe River, take the chairlift up to visit Yak Meadow (3700m) of Jade Dragon Snow Mountain. The cableway will be arranged according to the condition of the mountain. You will hike around 1 hour in the original forest in Yak Meadow (3700M). After lunch, you will enjoy the Impression Lijang Ethnic Show (Regular seat ) directed in Ganhaizi Meadow(3100M). A cultural show demonstrating the traditions and lifestyles of the Naxi, Yi and Bai peoples of the area. The show takes place inside Jade Dragon Snow Mountain Park at 3500m in an outdoor theater specifically designed to showcase the mountain which is used as a backdrop. 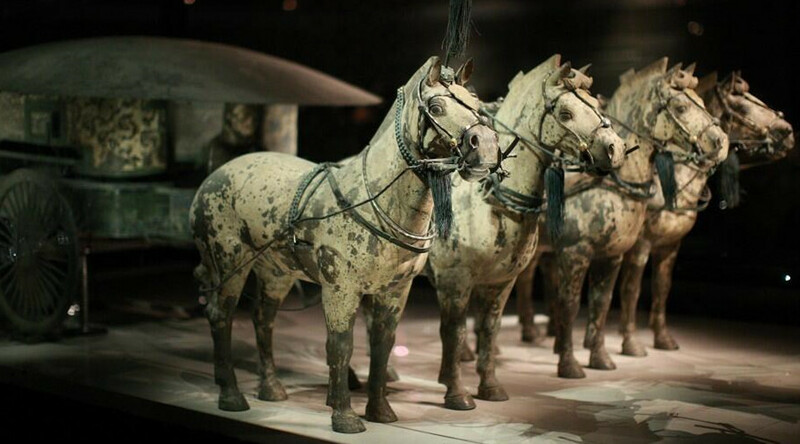 The production itself was designed by Zhang Yimou, Fan Yue and Wang Chaoge, a cast of over 500 people, and a number of horses. Later, move to Baisha Old Town for the tour of the Baisha Mural about 600 years old, which is one part of the World Cultural Heritage by the UNESCO 1997. From Lijiang, you’ll drive about 60KM to the First Bend of the Yangtze River with imposing gorge scenery, visit the Iron Chain Bridge,the Red Army’s Long March Memorial Monument in the Shigu Old Town. The town of Stone Drum got its name from a large, cylindrical, marble tablet shaped like a drum. The scenery is magnificent as the road running through the Lijiang valley which is filled with wheat fields and drying haystacks. Visit the Tiger Leaping Gorge (Shangri-La section ), the deepest gorge in the world. With 34 rapids of the Yangtze River, it is called the Jinsha in this area because you can find gold in the river. Afternoon, you’ll head for Shangri-La, the former Zhongdian which is well-known as the paradise destination for every tourist. Upon arrival in Shangri-La, you will have entered the Tibetan cultural area and a landscape of barley fields and yaks scattered in the valleys. 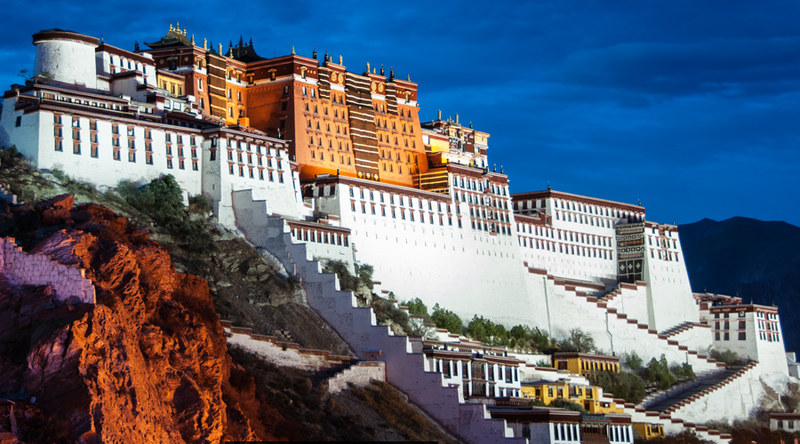 Fly to Lhasa, your guide will greet you and take you to your hotel. Tourists may view the Yarlung Tsangpo River/ Bhamaputra river (the Longest and largest river in Tibet) and Lhasa river on their way to Lhasa. With time permitting, you may go with tour guide to visit Tibetan handicraft art or Tibetan Traditional Medicine center. You can upgrade your service to enjoy Tibetan Culture Show in the evening (fr. 60USD). In the Afternoon, visit Sera Monastery which is another one of the “great three” Gelug monasteries of Tibet. The hot attraction is the Monks debate at around 3 – 5 in the afternoon. In addition, you can tour the Tibetan religious scripture printing house; inside the monastery, you can see three sand Mandalas and colorful Rock Painting of Buddha. In the morning, drive from Lhasa to Shigatse. On the way, drive over the Gampala pass (4790 m), and you will have a glimpse of Yamdrok-tso (4400m). The Lake is surrounded by many snow-capped mountains and in the distance you can have spectacular views of Holy Mount Nyenchen Khangsar, (7191m) the highest mountain near Lhasa. Later, we will pass and enjoy the Korola Glacier on the roadside. At Manak Dam Lake, you can hang pray flag at Simila Mountain Pass; Then, we will arrive in Gyantse, historically Tibet’s third largest city (after Lhasa and Shigatse). In Gyantse, we will visit the famous Pelkor Monastery and Gyantse Kumbum and enjoy the Far view of Gyangtse Fortress. In the morning, we will visit the home of Panchan Lama – Tashilunpo Monastery. Then, we’ll leave Shigatse after getting your Alien’s travel permit, and then drive to Lhatse, which is a small town where you can have lunch. After that, we will pass Tsola Pass(4600M), and Gyatsola Pass(5248M). Shortly after we enter Mt. Everest National Nature Reserve, tourists can enjoy the panorama of Himalaya at Gawula Pass(5198m). Then we drive along the New zigzag road to Everest Base Camp(5200m). You can get closer to gaze at the sunset of golden Everest peak if time and weather permits at the lodging area. You will take the morning flight from Lhasa to Shanghai. After arriving in Shanghai airport, you will manage the transportation from Shanghai airport to your hotel by yourself. You will free yourself after arriving on your own. You will manage the transporation from Shanghai hotel to airport. End the wonderful tour to China.